Come unto me, all ye that labour and are heavy laden, and I will give you rest. Take my yoke upon you, and learn of me; for I am meek and lowly in heart: and ye shall find rest unto your sould. For my yoke is easy, and my burden is light. (Matthew 11:28-30). These words of Jesus standing in front of the gates of Heavenly Jerusalem welcome all who enter the church by this door. 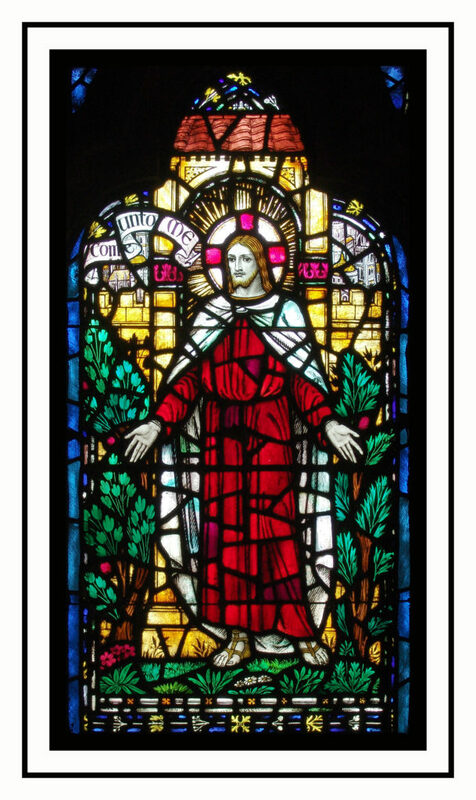 The window was given in memory of William J. Metcalf by his wife in 1928. This window was made in the James Powell & Sons Whitefriars studio from a design by Hodges. It was ordered at the same time as the chapel windows were. The diaries of James Hogan (1883-1948), artistic director of the Whitefriars studio from 1926, along with the Powell firm’s commission books, are in the Archive of Art and Design, Victoria and Albert Museum, London. They were read and excerpted for us by Dennis Hadley, retired physics professor, of Reading, UK.